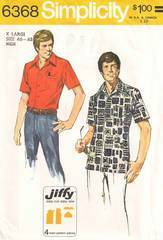 Men's Jiffy shirt with front button closing has collar, short set-in sleeves, square "comb" pocket and side slits. Top-stitching. Size XLarge; Neck 17-17½; Chest 46-48.